Could there be a finer place for a wine dinner than the Suttle Lodge? 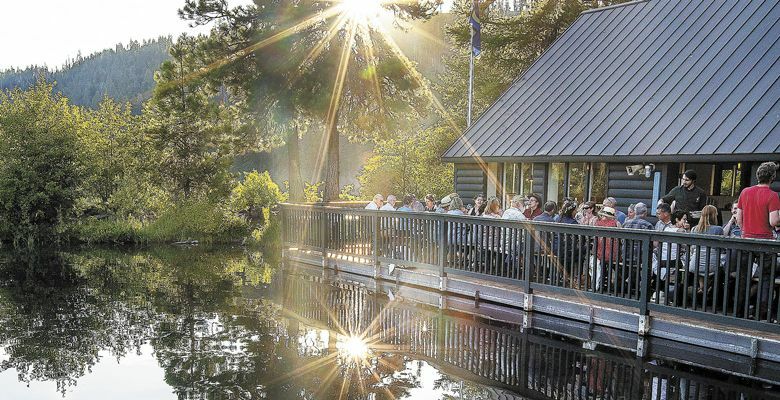 Picture this: Up to 40 guests share a single long table beside deep, glacial Suttle Lake in Central Oregon’s Deschutes National Forest. As the sun sets behind Mount Washington’s spire-like summit, ospreys soar overhead, their piercing eyes on the trout leaping for flies above the lake’s blue waters. And the outstanding food and wine keep coming. Had there been any doubt about the suitability of Oregon wines to al fresco dining in the high-lake country of the Cascade Range, those misgivings have been thoroughly dispelled by this “Dock Dinner” series. 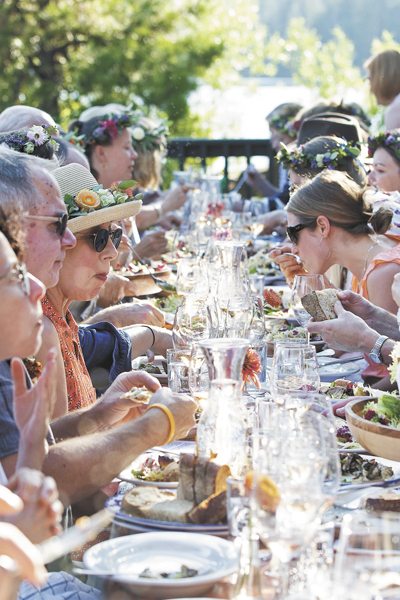 Continuing through August, the food and wine program at the renovated historic lodge and its Boathouse Restaurant is sharing the tastes and talents of the Willamette Valley — and beyond. Already this summer, Maya Lovelace of Portland’s Mae has prepared a Southern-style repast with the accompaniment of wines from St. Reginald’s Parish. Cathy Whims and Rob Roy of Nostrana will offer Italian cuisine on Aug. 5 with winemaker John Paul of Cameron Wines, and on Aug. 12, Sam Smith of Tusk will serve a Middle Eastern-influenced menu with wines from Greg McClellan of Suzor Wines. Dock Dinners are priced $125 to $150 per person, all-inclusive. Seats may be reserved at thesuttlelodge.com. Overnight lodging is available to ticketed dinner guests by calling the lodge directly at 541-638-7001. I was fortunate on July 22 to attend a dinner served by The London Plane, one of downtown Seattle’s outstanding restaurants, complemented by the Biodynamic wines of Oregon’s Montinore Estate. Chef Ricardo Valdes and his team employed an Arabic “mangal” barbecue in preparing their Eastern Mediterranean-style meal, while Montinore president Kristin Marchesi was on hand to describe her varietals. A cocktail half-hour began with two ripe blackberries in a wine spritzer of Montinore’s aromatic Borealis. This blend of Gewürztraminer, Müller-Thurgau, Pinot Gris and Riesling gave a pleasant edge to a pair of “toasts,” one made with artichoke hearts and muhammara (hot pepper) dip, the other with cucumber, preserved lemon and labneh (strained yogurt). A salad course featuring fava-bean hummus, an eggplant dip with pomegranate, and heirloom tomatoes was a crowd favorite. The feast of seasonal vegetables also included fresh figs, snap peas, shiitake mushrooms, hazelnuts and much more. Montinore’s 2016 L’Orange, a blend of skin-fermented Pinot Gris with amphora-fermented Muscat (10 percent), offered fruit, spice and floral notes. The main entrée was lamb kefta, a savory meat loaf presented with a variety of condiment sauces. My favorite was the minty Yemeni zhoug made with chilies, coriander leaves and garlic, but other choices — tahini, spicy harissa and urfa biber, a yogurt with chili flakes — added new dimensions of flavor. The meat was accompanied by a tray of roasted zucchini, fennel bulbs and Tropea red onions. What wine could possibly add balance to a course like this? Marchesi and Valdes chose Montinore’s 2015 Reserve Pinot Noir. The dessert course of moist rosewater-pistachio cake and crispy hazelnut baklava was matched with the Montinore Vivacé, a fruity sparkling wine. Located near Forest Grove, Montinore is considered to be the country’s largest producer of certified estate wines made from Biodynamic grapes. Established in 1982, the 200-acre estate vineyard was purchased in 2005 by Rudy Marchesi, grandson of northern Italian winemakers. 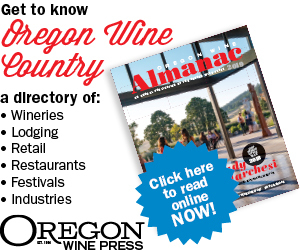 He remains active in the business today even as Kristin, his daughter, has primary management responsibility for the winery and additional vineyards in Chehalem Mountains and Yamhill-Carlton AVAs. Montinore produces 27 different varietals, specializing in Pinot Noir and cool-climate whites. 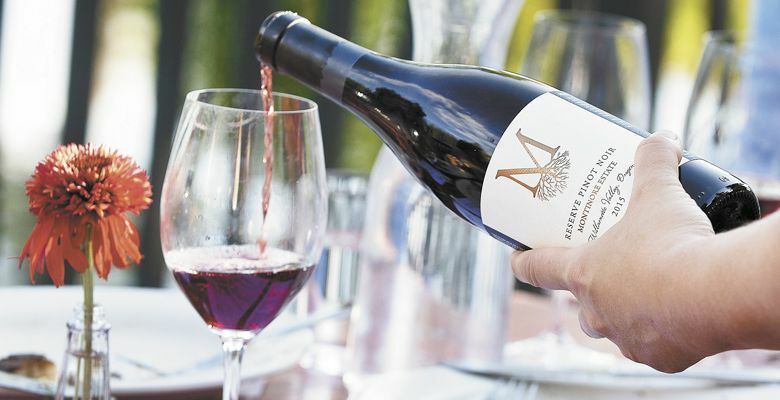 An estate Pinot is prominent on the excellent wine list at The Suttle Lodge; indeed, Kristin will return to Central Oregon on Aug. 23 to pour at the resort’s weekly wine tasting. The Boathouse Restaurant, developed with consultant Joshua McFadden of Ava Gene’s restaurant in Portland, serves breakfast, lunch and light dinners from 7 a.m. to 8 p.m. daily, Memorial Day weekend through Sept. 9. A full meal menu is served year-round in the main lodge, directed by chef Jacob Rodriguez. In 2018, a winter (January-to-April) guest chef series featured acclaimed Northwest chefs at least every other weekend. That series can be expected to continue in 2019. Various incarnations of the Suttle Lake Lodge have operated at the east end of Suttle Lake, 14 miles northwest of Sisters, since the 1930s. The 15.5-acre property was purchased in 2015 by The Mighty Union, a hospitality group best known for its role in developing Portland’s Ace Hotel, and reopened after major renovation in August 2016.